We're deeply concerned by the opioid crisis that has impacted families in every corner of the United States. We started by thinking about how to bring Google’s technical expertise to help families combat the epidemic. Research by the federal government has shown that prescription drug abuse is a large driver of opioid addiction, and that the majority of abused prescription drugs are obtained from family or friends, often from a home medicine cabinet. The U.S. Drug Enforcement Administration (DEA) has found that one way that Americans can help prevent drug abuse and addiction is to properly dispose of unneeded or expired prescription drugs. Yet many people aren’t aware of, or can’t easily find, prescription drug disposal programs in their communities. Using Google Maps API, our team worked with the DEA to create a locator tool for the National Prescription Drug Take Back Day this Saturday, April 28. The locator tool can help anyone find a place near them to safely dispose of leftover prescription medications. Click on the image below to access the locator, and enter an address or zip code to find nearby Take Back Day events this Saturday and help fight the opioid epidemic. Longer term, we’re working with the DEA and state governments like Iowa, Arizona, Massachusetts, and Michigan to gather data on year-round take back options for future Google Maps integration. In addition to making it easier to find take back locations, we’re also proud to support non-profit organizations on the frontlines of this crisis. We’ve worked with the Partnership for Drug-Free Kids since 2015 to help parents searching online for support connect to the Partnership’s Parent Helpline. This service provides free counseling and advice to parents who need help addressing the many challenges of a child’s substance use. Today, we’re announcing $750,000 in matching grants from Google.org to help expand the Parent Helpline and get even more families the support and help they need. 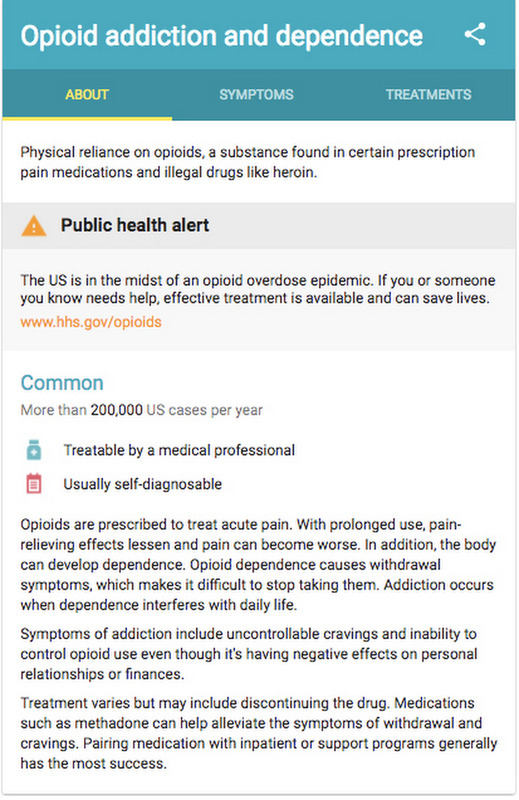 We’re also committed to ensuring that the public understands the danger of opioid abuse and the resources available for those who need help, by making useful information about opioid addiction and prescription drugs available in Google Search. There are no easy answers to a challenge as large as the opioid crisis, but we’re committed to doing our part to ensure that people in every corner of the country have access to the resources they need to address this urgent public health emergency.